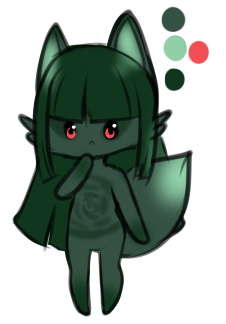 A Watermelon flavored vulpine sentient. She hails as a princess from the moon of a life-sustaining planet, which many scientists believe to be Gliese 581g. As a plant,she is able to take in light and make food via photosynthesis. She is also gifted with telekinesis. Scientists of the Lunar Gliesian Federation discovered a planet similar to theirs that could sustain life. This was Earth. encapsulated, she was sent to discover the unknown planet. However, her family expected her survival to become minimal. Instead, she lives with the Taketori family, and thus has their name. Mother and Father are theocratic royals, responsible for the production of Planetary moons. Set in a universe similar to The Tale of the Bamboo Cutter. She is petite, size 32 A Has hairlike cilia in placement of fur. Longer cilia for hair.
. Thanks a lot I'm gonna give you a bunch of Feline hugs and kisses a Lion[ess] Knows best to do!